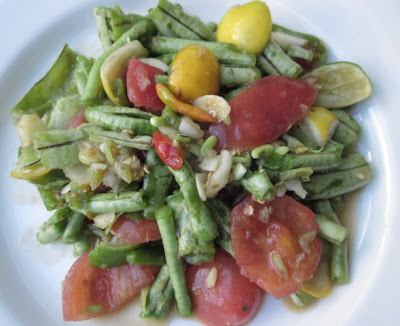 This is another dish of spicy salad that you will also get from Papaya Salad Restaurants. We make similar salad from different base ingredients. It could be green papaya, cucumber,green mango, long green bean or others. This was my fast lunch. I had it with crispy omelet and steamed rice. You see, it is a life saving recipe for me. Beat the chili and garlic together in mortar. When the garlic and chili is coarsely beaten/mixed, add the pieces of long green bean and continue beating until the green bean too being slightly open. Add the cut pieces of lime, tomato and yellow eggplants. 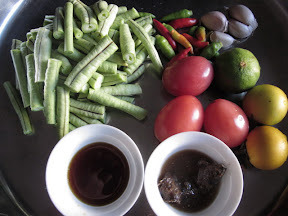 Season with the salty fermented fish and fish sauce; continue using the pestle to mix all the ingredients well. Try the taste and when you get your preferred taste, serve with other green vegetables.